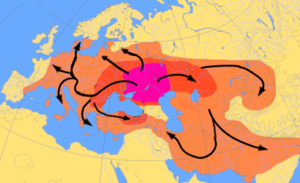 ↑ "History of Russia – Slavs in Russia: from 1500 BC". Historyworld.net. Retrieved 14 July 2016. ↑ "Finno-Ugric Peoples". Estonia.eu. Retrieved 14 July 2016. ↑ "Elupuu – The Finno-Ugric Peoples". Elupuu. Retrieved 14 July 2016.